Grilled Chicken Breasts. Talk about a delicious, easy, and quick menu choice for a hot summer night. I like to marinate the chicken in an extra virgin olive oil and lemon dressing and then, for a twist, steam over beer until almost cooked through.This incredibly moist chicken needs just a few minutes over a hot grill to add the smokey taste of BBQ, and the chicken is ready to pair with your favorite sauce. I love serving grilled chicken with fresh salsas. 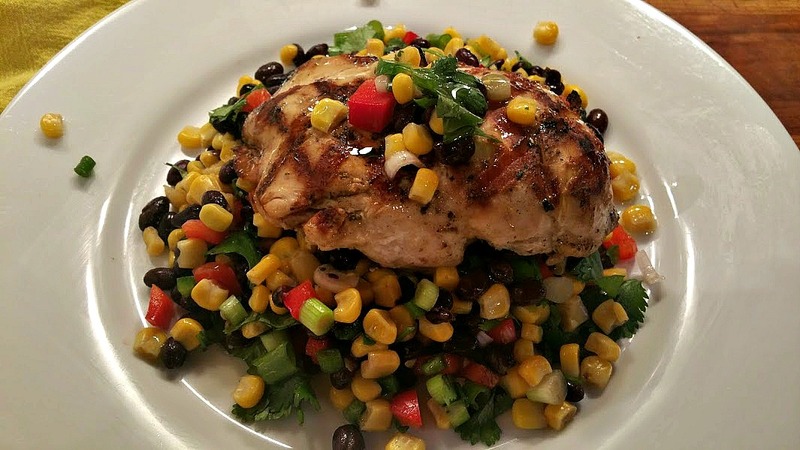 This recipe consisting of black beans, frozen corn (fresh in season) and crunchy vegetables makes a perfect pairing. Bring on summer everyone! Season chicken with salt and pepper. Add 1/2 cup marinade to rimmed baking sheet. Place breasts on top of the marinade. Drizzle additional marinade over the chicken. Refrigerate a minimum of two hours, up to eight hours, turning the chicken every couple of hours. Add beer to a large stock pot over high heat and bring to a slow boil. Place a metal colander over the pot and add chicken. Cover and steam until almost cooked through. (about 20 minutes). Remove from heat. Meanwhile, bring an outdoor grill to high heat. (or use a grill pan indoors). Place the chicken on the hot grill, cover, and cook 3-4 minutes or until deep dark brown grill marks appear. Turn chicken, cover and continue cooking until chicken reaches an internal temperature of 160 degrees (use a thermometer to check) and the juices run clear when pierced with a knife. Remove chicken from grill, place on a platter, and tent with foil. 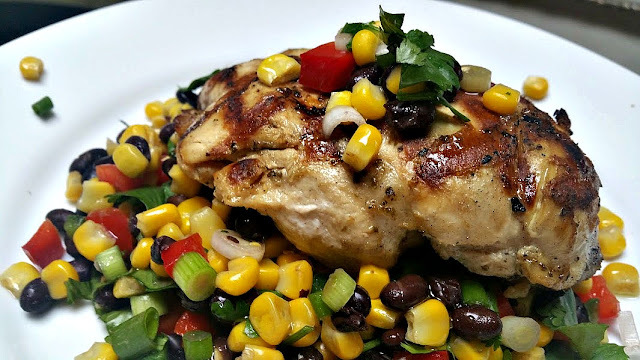 Serve chicken hot or warm, on a bed of the corn salsa with additional salsa spooned over top. 1 tablespoon fresh cilantro, chopped. Mix all ingredients together. Remaining marinade can be used on fish or fresh vegetables. Do not reuse marinade from the chicken. Combine first six ingredients in a medium sized bowl. Season to taste with salt and pepper. Refrigerate between 1 hour and 6 hours. Just before serving, stir in cilantro. Also delicious with corn tortilla chips. It is "Grilled Chicken" week at Food Network's Summerfest roundup. 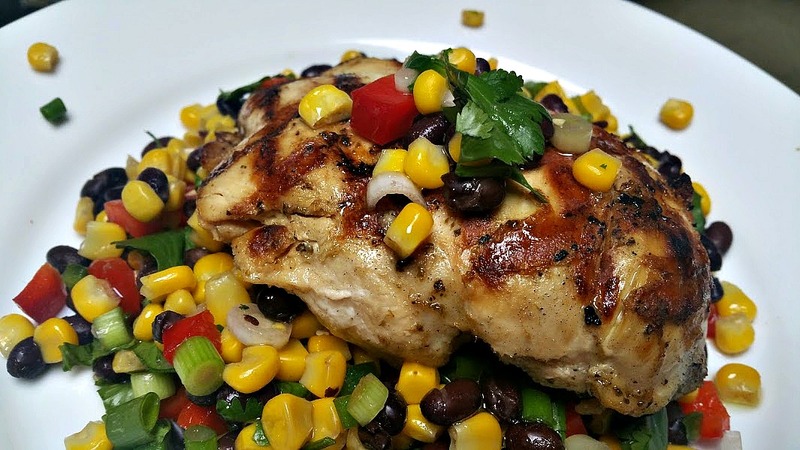 Do you have a favorite grilled chicken recipe to share? Please list (or link) in the comments below. And be sure to check out the other delicious sounding recipes from my blogger friends and Food Network.